Have you ever thought that your football knowledge is above par? Do you know the top players and teams inside out? Do you want to turn your knowledge into real cash? If so, Football Index could be for you! Football Index was launched in 2015 as a platform to trade football players. Thinking of Football Index as a stock market for footballers is the best way to understand it where you buy shares in a player and the better they do, the more your share prices increase! There's no betting on matches with the chance of losing your entire stake like in regular betting. 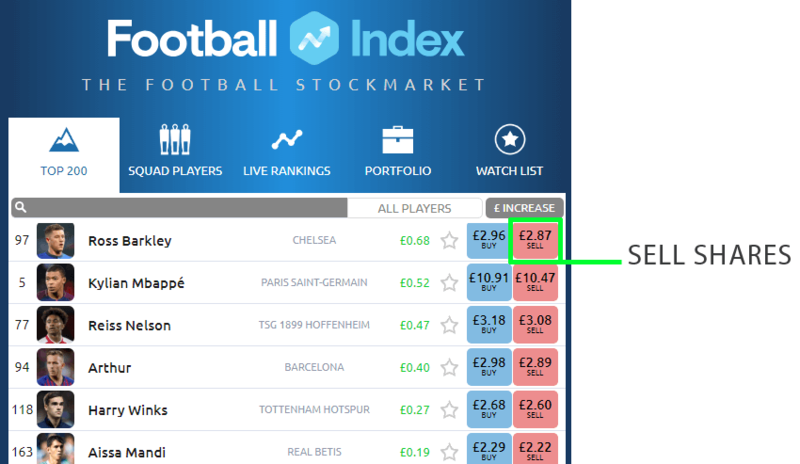 With Football Index, the shares you have bought will fluctuate based on a number of factors and the idea is to buy shares in players which you think will increase over time and then sell them at a higher price for a profit. It's an interesting concept that appeals to many people due to the fact your knowledge of the game, players and other factors ultimately determine how successful you are in your trades. After signing up to Football Index, you're able to start buying shares in players, but first, it's helpful to understand the basics of how the site works. The Football Index platform is made up of 4 main sections. Top 200, Live Rankings, Squad Players and Portfolio. The Top 200 list displays the top 200 players in the world based on Football Index share prices. You can buy and sell up to 100 shares in each player which is listed in the Top 200. The advantage of purchasing shares in players listed in the Top 200 is that they are eligible for both media dividends and performance dividends. These are daily rewards which are given by Football Index to customers who hold shares in players who are top of the Football Index live rankings at midnight. There are two categories in the Live Rankings section. 'Media' and 'Match Day Performance'. The two lists show how each player ranks against all other players based on media coverage and how they have performed in their latest match. The media coverage rankings are determined based on mentions by 25 UK football news publishers such as The Independent, Daily Express, Football365 and Metro News. Performance rankings are determined based on opta-powered performance rankings set by Football Index. Users who hold shares in the top players in each category will receive dividends. There is a different daily payout depending on the number of matches taking place that day and the daily dividend amount can be viewed on the site each day. Dividends are paid on the top 3 ranked players and the dividend amount is paid out to all customers who hold shares in that player. For example, if you held 100 shares in Paul Pogba who was ranked #1 in the daily rankings and the Media Day dividend payout was £0.10, you'd receive 100 x £0.10 (£10). These are additional daily bonuses and do not affect any profit you make from buying and selling shares. The Squad Players section is a list of football players who do not currently rank in the Top 200. You can buy and sell shares in players from this list, just as you would with players from the Top 200 list, and receive opta-powered performance dividends. However, you will not be eligible to receive media coverage dividends on these players until they feature in the Top 200 list. The portfolio section displays all the shares you currently hold in players. 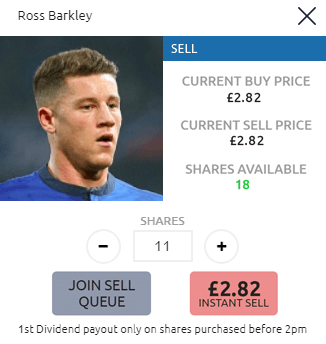 You'll be able to see what price you bought the shares at, how many shares you hold in each player, the current value of each share and how much profit or loss you have made on the shares. You can then choose to buy more or sell your shares in each player at the current prices. how are players prices determined? The price of each player on Football Index is determined by supply and demand. The more shares that are bought in a player causes their price to go up, whereas the more shares sold in a player causes their price to go down. The amount of media coverage and how each player performs will also affect the price as traders are more likely to buy players who are doing well and gaining more attention with the hope they will top the rankings chart and thus be eligible to receive dividends. There are two ways to make money with Football index. 1. 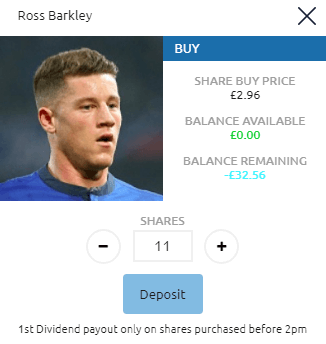 Through Dividends - If you hold shares in players who top the opta-performance rankings and the media coverage rankings, you'll receive dividends which are paid daily. 2. Buying Low, Selling High - The main aim on Football Index is to buy shares in players which you believe will increase. If you buy at a low price and your player performs well, more people will be inclined to buy shares in that player which will cause their share price to increase. You can then sell your shares for a profit. Buying shares in players is easy. Simply click on the blue 'Buy' button next to each player, input how many shares you wish to purchase and confirm the buy. If you've used betting exchanges such as Betfair Exchange or Smarkets before, you will find the buy and sell features familiar. Step 1: Find a player to buy shares in and click the blue 'BUY' button. Step 2: Enter the number of shares you wish to purchase and confirm your order. You will have to have enough available funds to cover the cost of the shares you are purchasing. Selling your shares in players is very easy but you are given an extra option compared to buying shares. When selling, you have the option to sell at the current sell price or list your shares for a price of your choice. The benefit of selling at the current sell price is that you can instantly sell your shares, whereas if you set your own price, you may have to wait a while for another user to buy your shares at your specified price. Step 1 - Select a player which you wish to sell shares of and click on the red 'SELL' button. Step 2 - Select whether to make an 'Instant Sell' or 'Join Sell Queue' to set a higher price. If you're looking to lock in a profit straight away then 'Instant Sell' is your best choice. If you don't mind waiting a while to sell your shares, you may wish to opt for 'Join Sell Queue'. how much money can you make on football index? The amount of profit you make on Football Index really depends on how much you invest, whether or not the shares in players you bought increase in price and whether or not you sell when they do increase. There's no doubt that you can make a good profit by trading players on Football Index and the better your knowledge of football and players, the more likely you are to do so. can you lose on football index? Football Index is a stock market for football players. Just like on the actual stock market, shares can go up or down. If your shares go down, you could lose money unless you hold them until they go back up. Therefore, it is advised that you start with a small bank before committing to large deposits and buys. Still unsure about Football Index? Join today and if you decide it isn't for you, receive a refund up to £500! That means you can make real-money trades and even if you make a loss, you can receive a full refund! Simply email Football Index, request a refund and it will be processed! The Football Index App is a must have for all dedicated traders. The price of players can change fast due to media coverage, injuries and match results. It's not always possible to be at a desktop or laptop when this happens and so having quick access to your account to check prices and buy & sell shares is essential if you want to stay on top of the game. You can do everything on the Football Index App that you can on the website and so its extremely useful. Buy & sell shares, check prices, view price history data, check media coverage & match day result rankings & more. If you are registering for the first time through the app, you are still eligible to receive the new customer offer of up to £500 refund in your first 7 days. The Football Index App is available for iOS and Android devices from the associated app stores and is free to download. Football Index is an interesting platform that is not only fun but can also make you money. It's perfectly suited to football fanatics who live and breathe football and who enjoy keeping up date to with the latest headlines, transfers and other events which could cause player share prices to go up or down in value. It is important to remember that this is still trading with real money and although fun may be the primary objective for most Football Index customers, it is possible to lose money. The platform Football Index provides is simple yet effective. It doesn't take long at all to get used to how buying and selling works and finding your way around the site. One of the best things about trying Football Index for the first time is their 7 day risk-free trial. It's an extremely generous offer which allows you to trade shares in players for real money without the risk. It's a great incentive to give Football Index a go and I'm confident you'll be pleased you did so.